Recently, this tweet from NFL on ESPN was brought to my attention, which contains the following image. 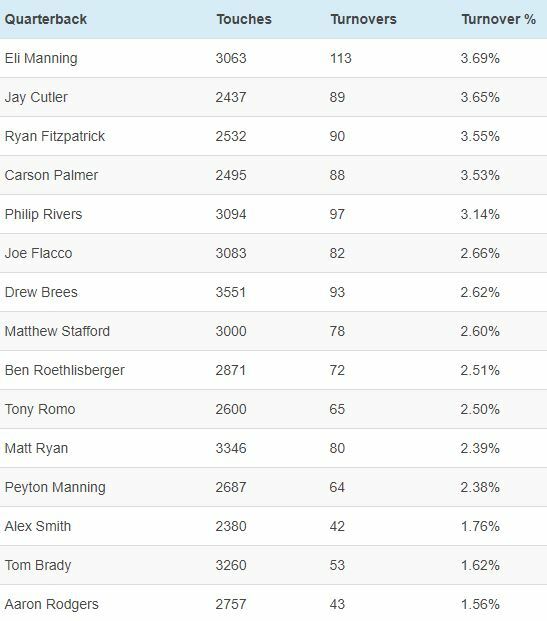 Some people wondered why Jay Cutler, with his reputation for being a turnover machine, was not on this list. A quick search of statistics indicated Cutler has 89 turnovers in that 5-year span, just missing the cut. However, total turnovers is a misleading statistic; Cutler has played in only 66 games in that 5-year span, while Brees, Rivers, and Manning have all played 80. Thus, it will be more accurate to look at the frequency with which turnovers occur. I expanded the search to include all quarterbacks who have been (more or less) full time starters for the last five years, a list that includes 15 quarterbacks. The table below shows the number of games they have played, the turnovers they have committed, and their turnovers per game in that period. Here we see that Cutler is among the worst quarterbacks at turning the ball over, but he is certainly not an outlier. 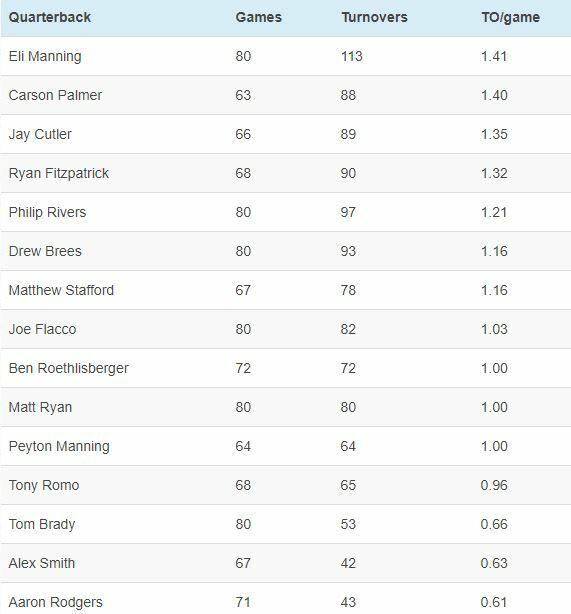 Eli Manning and Carson Palmer both average more turnovers per game than he does, and Ryan Fitzpatrick is very similar to him. Of course, just looking at turnovers per game can be a bit misleading, as some quarterbacks handle the ball more than others. Therefore, the best way to look at this is by the number of turnovers relative to the number of plays in which turnovers were possible. Turnovers included both interceptions and fumbles lost, while I counted a quarterbacks’ touches (pass attempts, rushing attempts, or sacks) as their total plays. Thus, the formula is turnover percentage = (interceptions + fumbles lost)/(pass attempts + rush attempts + sacks). The table below shows the results. Here we see Cutler once again is among the worst quarterbacks, and in fact he comes off a little worse in turnover percentage than turnovers per game. Cutler is still not the worst full-time quarterback in the NFL at turning it over, but he is up there. While there are other factors involved in quarterback play than avoiding turnovers (which is why Peyton Manning is widely considered to be better than Alex Smith), turnovers are certainly very important. Turnover differential is vital for determining wins in a season and has a very strong correlation to success in games when the Bears have Jay Cutler under center. So what can Chicago’s new coaches do to limit Cutler’s turnovers going forward? One big step will be running the ball more; this limits Cutler’s touches per game, which will limit his turnovers. Of course, Cutler has averaged only 36.9 touches per game over the last 5 years, 2nd fewest of the 15 quarterbacks in this study. But that number was at 42.5 in 2014, which would be higher than every quarterback in this study except Drew Brees and Matthew Stafford. Going back to a more balanced offense like what Cutler saw from 2010-2013 will help some. One area the Bears can definitely look to improve on is Cutler’s fumbling. His 22 fumbles lost over the last 5 years lead all quarterbacks in this study, and he fumbled on 0.9% of his touches, also the highest mark of any quarterback. In fact, only Ben Roethlisberger (0.8%) comes even close to that; everybody else was between 0.3% and 0.6%. Chicago can look to improve this through a combination of better fundamentals and better pass protection, as many fumbles come on sacks. Cutler has been sacked on 7.5% of his dropbacks over the last 5 years, which is far too high a number. As an added bonus, a more balanced offense, like we discussed before, can slow down the pass rush as well. Jay Cutler turns the ball over too much. This is not a shock to anybody, but the numbers say he has a few peers with similar turnover rates. No matter what Chicago’s new coaches do to help Cutler improve, he is always going to turn it over more than you would like; it’s in his DNA as a gunslinger quarterback. They should be able to help a bit by focusing on running the ball and pass protection, but Cutler’s high turnover rate is a big part of the reason why he is unlikely to be in Chicago for more than the next 2 years.